This is part of a Mickey and Minnie Professionals series. 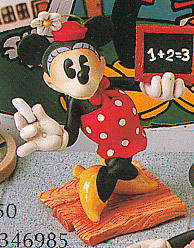 There are six figurines in the series: Mickey as Businessman, Mickey as Policyman, Mickey as Fireman, Mickey as Doctor, Minnie as Nurse, Minnie as Teacher. This is a must have for Mickey lovers!